The Showcase of the Immortals is upon us, and it’s a bloody long one. 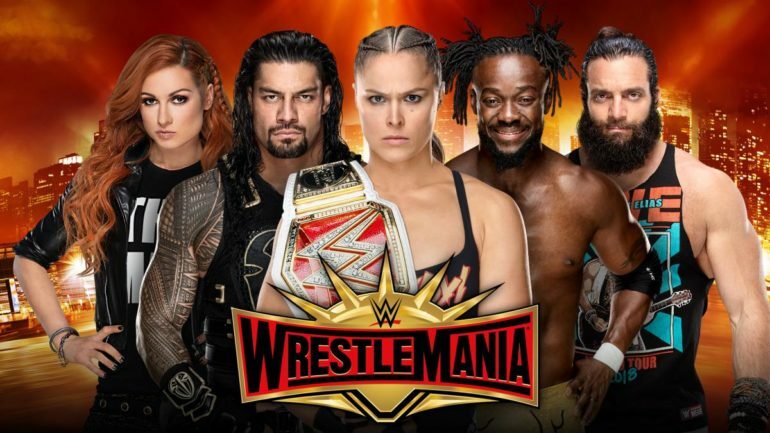 There are currently 16 matches pencilled in for WrestleMania 35, but if Fastlane taught us anything last month, it’s that the card is always subject to change. For the first time in my life, I actually get to attend the show itself this year, and the rumoured seven-and-a-half hour running time will be an endurance test like no other. There are retirement matches, grudge matches, weird matches, and a historic main event. There’s so much here in sheer variety that you’d be hard-pushed not to find something that’ll interest you. Several matches have show stealing potential, while some may be crushing disappointments. Well, let’s not dilly dally any more, here are our predictions for this year’s Granddaddy of them All! Who doesn’t love a good battle royal? Well, I’d like this one a whole lot more if it wasn’t full of women who should be on the main card. There’s little use in breaking down every entrant, as only a few actually have a chance at winning. Much like last year, I doubt this match will have any long lasting effect on the women’s division. It’s just a transparent method of getting as many people booked on the show as possible. Prediction: There’s a few viable candidates: Mandy Rose, Sonya Deville, Lacey Evans, last year’s winner Naomi, but I’m playing it safe and picking Asuka. She got screwed out of her spot on the main card by dropping the SmackDown Women’s Title to Charlotte a couple of weeks back, she deserves compensation. Who doesn’t love a good…wait. Ah yes, it’s the second battle royal on the card, and likely one that will also be of no consequence. The ARMBAR, as it’s affectionately known, hasn’t really produced any notable winners (sans Baron Corbin) in its five-year run, and this is most definitely going to be much of the same. Still, people are getting paid, which is always good. Prediction: I’ve whittled my choices down to two options: Andrade and Braun Strowman. Braun’s a fairly obvious answer, as he’s been the only guy on TV whose presence in the match has actually received any real attention. Andrade’s in the running because for God’s sake, he needs something to do. The fact he’s not in the US Title match is frustrating to say the least, so could this be his first step towards greatness? Seeing as winning the ARMBAR is a meaningless accomplishment, I’m going with Braun Strowman. He already won the Greatest Royal Rumble, why not add another nothing accolade to the pile? It can go right next to his one-day Raw Tag Title run with a ten year-old. Oh yeah, and there are some Saturday Night Live guys in the match as well, so yeah. With what will undoubtedly be the highlight of the pre-show, the Cruiserweight Title will again be decided in a tournament final at WrestleMania. The only difference is that the belt is actually on somebody this time, and it’s only Buddy bloody Murphy. The most dominant champion in WWE who isn’t called Pete Dunne is ready to swat away his friend turned rival, Tony Nese. Do I even need to explain why this will be great? It’s Buddy Murphy and Tony Nese, it does what it says on the tin. Prediction: Logic would dictate that Buddy’s reign ends at the big show, but I’m not so sure. He’s been built up as such an insurmountable challenge that I don’t know if Tony Nese is credible enough to dethrone 205 Live’s Juggernaut. Don’t get me wrong, I’m a fan of Nese’s work, but is he really the one to stop pint-sized Brock Lesnar? Call me crazy, but I think a certain Japanese star called KUSHIDA might be lined up for that role. Buddy Murphy to retain. Well, there’s last minute title matches and then there’s…this. The Revival have somehow been worse off since winning the Raw Tag Team Championship, routinely losing matches and letting the whole world know that they’re not happy on Twitter. Meanwhile, the reunited Edgeheads have formed an alliance in the name of accomplishing two things: win gold, and end Curt Hawkins’ ungodly losing streak. Prediction: This sounds batshit insane, I know, but I’m predicting Curt Hawkins & Zack Ryder get the win. Curt’s losing streak has been going on for so long that there has to be a payoff of some kind. A title win at Mania makes sense. As for The Revival, I’m sorry lads. So many multi-man matches, and they’ll all only be about ten minutes. This is essentially the SmackDown tag division feat. NXT and will either be utter chaos or a thrilling spectacle. Maybe a bit of both. Everyone involved in this could be of better use elsewhere, but we live in a reality where Vince McMahon doesn’t really care much for tag team wrestling, so we get rushed groupings like this. Prediction: Let’s push the boat out and say Aleister Black & Ricochet, I don’t even know why I’m picking them, I just have a gut feeling. Black’s been heavily protected and not took a single pin since coming up to main, and everyone loves a high flyer like Ricochet. WWE’s booking style has been wholly unpredictable as of late, this might just be the match that embodies that. This is the contest that could steal the entire show. Both AJ and Randy have given it their all in the build to this match. Their promos have been on point, the insults have cut deep, and you can tell there is a healthy amount of professional respect between them. It’s TNA vs. WWE, the indies vs. the establishment, and it’s gonna be bloody great. Prediction: Could go either way, but Randy’s been getting the upper hand on AJ a lot it seems. I’m going with AJ Styles after he presumably finds a way to counter an RKO outta nowhere. It’s tough to say anything here, as this match may not even be happening. Rey Mysterio apparently picked up an ankle injury on Raw this week, but the match hasn’t been officially cancelled at the time of this writing. Here’s hoping a match of some description happens, as I don’t know if I can take Samoa Joe missing out on Mania for the third year in a row. Prediction: Assuming it goes ahead, Samoa Joe. More fatal four-ways! Yay! Beth Phoenix is back, that’s cool. Not much else to say really, these are the people you’d expect to see here and I don’t know if this will have a particularly substantial spot on the card. There are several filler matches and sadly, this is shaping up to be one of them. Prediction: Boss ‘n’ Hug Connection, if not purely for the fact I’ve got the other two tag titles changing hands. Though I’d love an IIconics win. Hell, the surreal nature of Beth Phoenix holding a championship in 2019 would even be a welcome sight. Just keep the titles away from Nia and Tamina, please. Why Finn had an eight-day reign with the belt is a mystery, as Bobby won it right back as if nothing ever happened. This feud has long overstayed its welcome, and it’s mad to think that Finn was challenging Brock Lesnar for the Universal Title less than three months ago. Prediction: The fact that Finn is bringing out The Demon is a major spoiler. Bobby Lashley simply isn’t going to be the first man to beat Finn Bálor with his spooky body paint on the main roster. Now this is a match with some real heat and story behind it. The slow burn of Miz and Mac’s friendship forming and falling apart dates back to early November, and has been one of the highlights of SmackDown Live. The falls count anywhere stipulation means Shane is going to perform one of his infamous jumps off of something massive, seeing as he thinks he’s WWE’s answer to Tom Cruise. Miz has, amazingly, got over big time as a babyface, meaning there will be real investment from the crowd to cover for the technical limitations of the men involved. Prediction: In the build up to this, The Miz just seemed like the clear winner. Shane never wins these big matches, but I’ve been swayed recently. Miz keeps overcoming the odds on SmackDown, no matter what obstacles are put in his way. I believe Shane McMahon is going to pull out ever heel trick imaginable to secure victory and continue this stellar feud. This is a great match on paper, and the build’s been solid as well. I have to say, after four years of Roman main eventing, it’s odd seeing him in an undercard match at WrestleMania. Drew has played his role to perfection, picking apart the status quo with a rude welcoming party to mark the Big Dog’s return. Roman, meanwhile, has looked far more human. He’s not been taking McIntyre’s attacks in his stride, instead looking broken down and battered. Prediction: Roman Reigns. Drew’s time will come, but Roman is not losing his first singles match since beating cancer. We appear to be in 2005 again, and I’m all here for it. Batista’s four-word promo on Raw this week utterly demolished Triple H’s 20-minute spiel from the week before. Every time Dave shows up, he gives us a gif-worthy moment that reminds everyone why he’s so beloved. Though this does all come off as a Triple H vanity project, let’s be honest. Still, it’s no holds barred and it had better be a nonsense brawl like Brock vs. Goldberg two years ago. Just give us what we want, which is nothing but finishers, signatures, and weapon shots. Prediction: Hunter’s career being on the line is a dead giveaway. He’s also never beat Batista in singles action before. Much like his feud with The Undertaker last year, this is all about Triple H getting his win back. Undoubtedly the most emotionally charged match on the card, Kofi Kingston’s impossible rise in the last couple of months has eerie echoes of Daniel Bryan’s back at WrestleMania 30. The irony isn’t lost on any of us that Kofi represents what Bryan used to, before he turned his back on the fans to become an evil…vegan who wants to help the environment. Okay, so Bryan’s values aren’t villainous in the slightest, but still, it’s been an incredible narrative and the match should be much of the same. Prediction: Say it with me now: Kofi Kingston. Wishful thinking? Probably. The most satisfying moment in recent wrestling memory? Absolutely. Kofi snagging his first world title on the biggest stage possible would give all of us cause to celebrate. Bryan’s work has been some his best, but it’s time for KofiMania to run wild. Also, I pray to the Heavens that he comes out to SOS, for old time’s sake. This match just doesn’t feel as big as it should do. This is mainly due to the apathy towards Brock Lesnar and the fact that there are two other top matches with a lot more intrigue. If Brock’s recent bouts with Finn Bálor and Daniel Bryan are any indication, this will be great. It just feels like it’s missing that spark that pushes a world title match from noteworthy to truly must-see. Still, I know that they’ll turn it up once the bell rings. Prediction: I’ve got the sickening feeling that Brock Lesnar is not done with the belt yet. Of the three marquee matches on the card, this is the one where the babyface losing would produce the least hostility from the crowd. We’ve just grown so numb to Brock that it’s hard to even get angry at him winning anymore. Obviously, Seth’s more than earned the right to slay the Beast, but I can’t see it happening. The first ever women’s main event of WrestleMania. History in the making. And the build’s been…complicated. No, this match doesn’t need both women’s titles, and you could argue it doesn’t even need to be a triple threat. But I suppose Vince McMahon’s ethos is go big or go home, even if it’s to the detriment of every woman not involved in this clash. Having said all that, it’s still a blockbuster contest on paper, and one that’s been built towards since Survivor Series. It is more than worthy of closing the show. Prediction: It has to be Becky Lynch. No disrespect to her opponents, who have done great work in the last year. It’s just that this is the main event of sodding WrestleMania, your white hot babyface has to win. Heels typically don’t leave Mania as the ultimate winner, in fact, it’s only happened five times. So, fingers crossed that this logic holds true and The Man walks out with both belts.